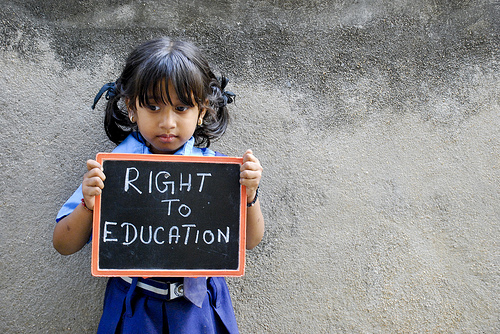 The Supreme Court in its historic judgement 3 days ago upheld the Right to Education (RTE) act. By doing so it has ordered all schools in the country to admit 25% students from the poorer sections of the society. This has led to a twitter storm, innumerable television debates fuelling the minds of the people with crass that is irreparable on their psyche. The educational system of any country should empower the masses irrespective of their race, religion or colour but not create islands of intelligentsia. Education should act as an enabler of dignified life but not kill the instinct half way. This sadly is misinterpreted and misunderstood. I make an attempt here to offer my understanding of the RTE and more particularly of the spoilt Indian psyche. The RTE was passed by the Indian parliament in August 2009 and enacted into a law in April 2010. Hailed as one of the greatest achievements of the UPA-II government it received widespread accolades both locally and internationally. By making education a fundamental right, India entered a league of select countries in the world where every child gets free and compulsory education up to a certain age. In India it is up to the age of 14. The constitution of India has put education under the purview of the states. Thus the act makes the states and the management of educational institutions accountable for its implementation. This is but obvious. The central government cannot monitor the implementation in far away Kutch or Kanyakumari sitting in Delhi. The states passed on the buck to private school managements without a framework to which they revolted against. In India any responsibility is considered everyone’s responsibility and thereby making it nobody’s responsibility. This is what that has happened to the RTE now. The central government says elementary education is not under their supervision, the states say they have given autonomy to private managements and the private managements in turn say the act itself is unconstitutional. Bravo! We of course are world champions in passing the buck. Down the decades it was we who pampered the private schools and made them into demigods of education. It was we who certified private schools as schools for the privileged and the elite. And that has become their war cry now. You can’t challenge a system with hypothecated beliefs. It is understandable when the management of the private schools say they will fall short of funds if they admit 25% of their students for free. The constitution clearly says running an educational institution should be out of charity. All education in the country is not for profit. But who cares!? Baba Saheb is long dead, right? But the self bracketed ‘elite’ in our country feel if their child studies along with their bai’s (maid’s) child, it will push their child to mediocrity! I read a tweet that has gone viral and has been re-tweeted by thousands of people- “RTE may be well-intentioned, but it will effectively drown #India’s few islands of private excellence in a sea of mediocrity.” By assuming that diversifying a classroom will lead it to mediocrity; you are branding yourself a paranoid! I would offer the same argument for assuming that the poor child cannot pick up studies in a rich school. If we accept and design the system in a conducive manner, nothing will stop us from achieving a 100% literate and an intellectually mature nation. But as always the bad things flow out faster and reach to more number of people. Now the parents too have joined the anti-RTE brigade without giving a hoot about what it does to the overall education of the country. They want their bai to clean their toilet but not her child to study along with their child. The RTE is just not about free and fair education. It’s about bringing the poor to the mainstream society through the means of their children. It’s about enabling the country’s education system where even the government schools become accountable to what they do. From a tender age the kids learn to get along with each other without the society planting notions into their head. This I see leads only to an India which is more tolerant, dignified and where every man has his respect sanctioned and quantified. But sadly, this hardly is visualised and noticed. The managements are behind the money and the parents in their cocooned feudal mindset. Nelson Mandela in his presidential address to South Africa said- “Education is the only force through which you can change the country”. And change, they brought. Today South Africa is one of the fastest growing nations in the world. Coming out of Apartheid and the civil war, they have built a great country out of their own ruins. While India was feudal even before the British came. Even today we are the same. The only difference being the British made us intellectual slaves of the west. Losing our individuality is another case altogether but do we really need to oppose educational reforms in the name of elitism and money? Who is elite in India? HD Devegowda was once a sweeper and now he owns half of Bangalore! Will we forever be each other’s obstacles? I hope we will join hands one day or the other.